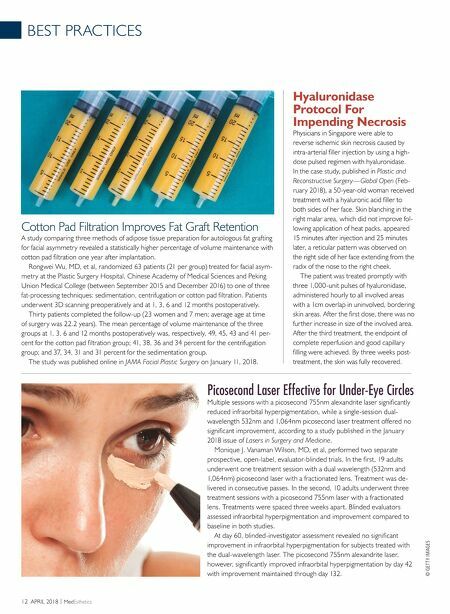 BEST PR ACTICES 12 APRIL 2018 | Med Esthetics © GETTY IMAGES Cotton Pad Filtration Improves Fat Graft Retention A study comparing three methods of adipose tissue preparation for autologous fat grafting for facial asymmetry revealed a statistically higher percentage of volume maintenance with cotton pad fi ltration one year after implantation. Rongwei Wu, MD, et al, randomized 63 patients (21 per group) treated for facial asym- metry at the Plastic Surgery Hospital, Chinese Academy of Medical Sciences and Peking Union Medical College (between September 2015 and December 2016) to one of three fat-processing techniques: sedimentation, centrifugation or cotton pad fi ltration. Patients underwent 3D scanning preoperatively and at 1, 3, 6 and 12 months postoperatively. Thirty patients completed the follow-up (23 women and 7 men; average age at time of surgery was 22.2 years). The mean percentage of volume maintenance of the three groups at 1, 3, 6 and 12 months postoperatively was, respectively, 49, 45, 43 and 41 per- cent for the cotton pad fi ltration group; 41, 38, 36 and 34 percent for the centrifugation group; and 37, 34, 31 and 31 percent for the sedimentation group. The study was published online in JAMA Facial Plastic Surgery on January 11, 2018. Picosecond Laser Effective for Under-Eye Circles Multiple sessions with a picosecond 755nm alexandrite laser signifi cantly reduced infraorbital hyperpigmentation, while a single-session dual- wavelength 532nm and 1,064nm picosecond laser treatment offered no signifi cant improvement, according to a study published in the January 2018 issue of Lasers in Surgery and Medicine. Monique J. Vanaman Wilson, MD, et al, performed two separate prospective, open-label, evaluator-blinded trials. In the fi rst, 19 adults underwent one treatment session with a dual wavelength (532nm and 1,064nm) picosecond laser with a fractionated lens. Treatment was de- livered in consecutive passes. In the second, 10 adults underwent three treatment sessions with a picosecond 755nm laser with a fractionated lens. Treatments were spaced three weeks apart. Blinded evaluators assessed infraorbital hyperpigmentation and improvement compared to baseline in both studies. At day 60, blinded-investigator assessment revealed no signifi cant improvement in infraorbital hyperpigmentation for subjects treated with the dual-wavelength laser. The picosecond 755nm alexandrite laser, however, signifi cantly improved infraorbital hyperpigmentation by day 42 with improvement maintained through day 132. Hyaluronidase Protocol For Impending Necrosis Physicians in Singapore were able to reverse ischemic skin necrosis caused by intra-arterial fi ller injection by using a high- dose pulsed regimen with hyaluronidase. In the case study, published in Plastic and Reconstructive Surgery—Global Open (Feb- ruary 2018), a 50-year-old woman received treatment with a hyaluronic acid fi ller to both sides of her face. Skin blanching in the right malar area, which did not improve fol- lowing application of heat packs, appeared 15 minutes after injection and 25 minutes later, a reticular pattern was observed on the right side of her face extending from the radix of the nose to the right cheek. The patient was treated promptly with three 1,000-unit pulses of hyaluronidase, administered hourly to all involved areas with a 1cm overlap in uninvolved, bordering skin areas. After the fi rst dose, there was no further increase in size of the involved area. After the third treatment, the endpoint of complete reperfusion and good capillary fi lling were achieved. 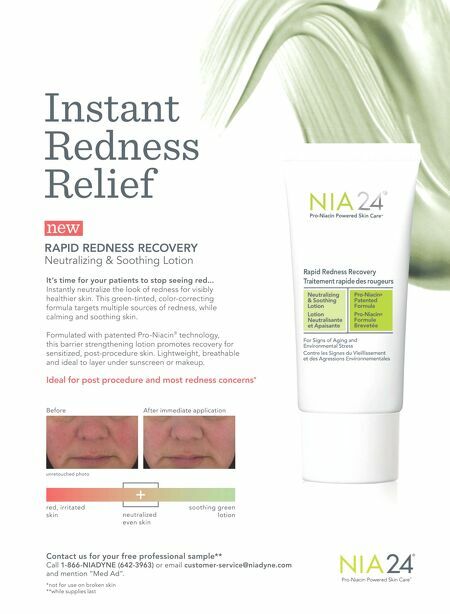 By three weeks post- treatment, the skin was fully recovered.